We miss the turn for Montreal first time around. I am a budget traveler so when everyone said ‘See Montreal as soon as you can’, I got on Kijiji (Craigslist for Canadians) and found a ride share. I could have done a bus but I had never done a ride share before. I am nothing if not curious. There are four of us in the car, four ladies. One is visiting from Malaysia. The driver is going home for the weekend. The three of us strike a rapport immediately. The fourth person turns out weird and we are all relieved that she is first to be dropped off. I am next. I had booked a room in AirBnB in Rue. My host is a girl from Togo. She had good reviews. My friend Mohan, an expert in all matters AirBnB told me “Anything below 4 stars is bad. Pick anything above.” The room at Rue Du Verdun has 4.3 stars and is cheap. I get off at the station closest and walk 6-8 mins. My room had huge walkout Windows. I would wake up to birds and flowers and sounds of children playing. To welcome me, my host shows me around Rue Du Verdun. The next day I take the tour of Old Montreal. This where I learn that Hollywood been lying to me most my life. In X-Men days of the Future Past, Mystique jumps out of the window in Paris. I see that building. I see that window. In Montreal. Here is the thing; Montreal is a lot like Paris and 3 hours away by flight from New York, maybe 6 hours from LA. Cheaper for Hollywood to shoot from Montreal than Paris so next time you see a movie claiming a scene in Paris, it might really be Montreal. Our tour guide is a kind young man. The tour is free. He does it because he loves Montreal he tells us. Would I love Lagos that much? Ever? We see the Basilica Notre Dame where Celine Dion got married. I learn so much about the city in that one tour that my brain feels inudated. I fall in love with the underground mostly. It all feels like a piece of Europe that someone forgot to take back with them. People are kind here, kinder than Toronto. If you know Toronto, you know this is a major feat. The men flirt outrageously. There are winks, smiles and as I walk to the famous market one morning, a man stops me by the traffic light and says ‘Belle. I know what ‘Belle‘ means but I am not sure I heard it well so I say “No french ‘ to him with a smile. The lights turn green and we cross the road as he says ‘you are beautiful‘ in a heavy accent. I want to cry, I want to tell him how beautiful I think he is too, I want to wink at him and tease him about saying this to all other women he meets at traffic stops but it is the summer 2015 and I am still putting back the pieces of my broken heart from last winter. So I wave to him and he waves back. The market is a lot more colorful for his smile. 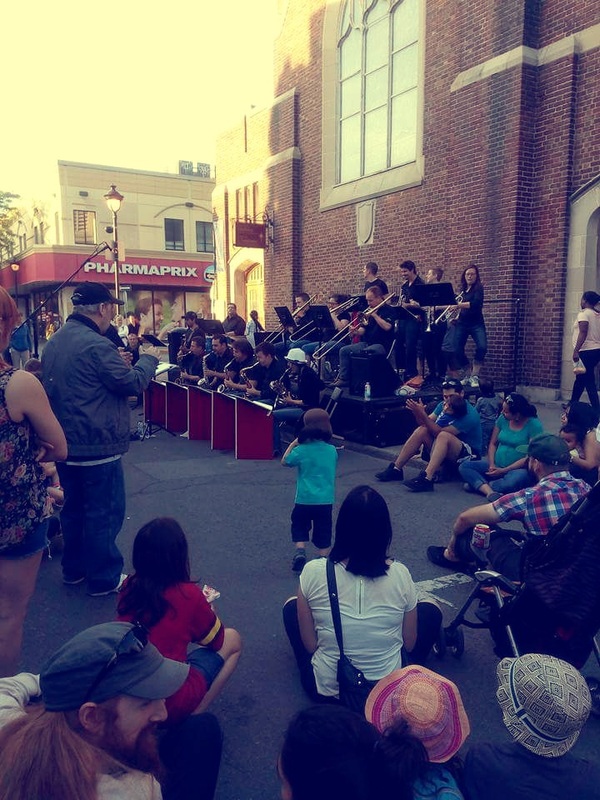 At Rue du Verdun where I spend my nights loving Montreal, there are street parties almost everyday. Safie tells me it is common with the summer. I eat all kinds of food. I ignore my tightening jeans and order smoked meat sandwich after smoked meat sandwich. I do poutine once and hate it. I eat and eat till my tongue will never be able to forget the taste of Montreal. I am here the weekend of the Grand Prix. My father is a car connoisseur. He brought me up to love cars and so I do my duty by him and go ogle Ferraris, Teslas, Porsches etc. Everything, everyone and everywhere smells of money here. It is also the day Barcelona plays the Champions League final so I wear my jersey and when we win, I get hugs and high-fives. There is one last place to be seen. It is the culmination of everything. I take the train and a bus. I am about to cross the road when an old woman stops me to ask if I can help her cross the road. She asks me where I am going and I tell her. She tells me it is for this reason she keeps on living here even though she is old and has lost her loving husband many years now. We talk and laugh over the few minutes it takes to help her get to where she is going. I still believe she was an angel. I cannot be convinced otherwise. St Joseph’s Oratory takes my breath away at first glance. I have to climb up Mount Royal to see it. I am huffing and puffing by the time it comes into view. But it is worth it. It truly is breath taking. And while the architecture is grand, it is a wall I find there that breaks my heart. Leaning against this wall are crutches of all shapes and sizes, evidence of miracles that have taken place here. I think all churches, big or small should do this- have a wall of remembrance, because while we are made in the image of the God that never forgets, we are not God and we forget. There are people praying everywhere; in the chapel, on the grounds, on the stairs. I think that when they started building this place God must have felt the way He felt when Solomon decided to build Him a house. Montreal is perfect. Old, beautiful, scholarly, gracious, religious(streets are mostly named after saints). Maybe it is this, maybe it is the kind people, but it would not surprise me one bit to turn a corner and find an angel, wings in place playing an accordion. Now I want to visit Montreal too…. sounds so lovely! You captured the essence and spirit of the city. Now, yes, I will like to experience God at every turn on the streets of Montreal.